Income Tax is levied on the basis of residential status of an individual. Therefore, it is important to determine the residential status. Residential status is checked every year and it may vary from one year to another. Individual is in India for 182 days or more during the previous year. Individual is in India for 60 days or more during the previous year and has been in India for 365 days or during four years preceding the previous year. If both conditions are not satisfied, then the individual is Non-Resident. If an individual is an Indian citizen and leaves India during the previous year for Employment or as a member of the crew of an Indian ship, then the individual can be resident only if the individual stays in India for 182 days or more during the previous year. Thus, second condition is not applicable. If an individual is an Indian citizen or belongs to Indian origin, being outside India visits India during the previous year, then an individual can be a resident only if an individual stays in India for 182 days or more during the previous year. Thus, second condition is not applicable. He has been in India for 730 days or more during 7 previous years immediately preceding the previous year. 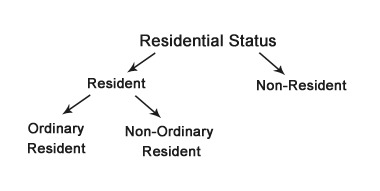 If the person does not satisfy any of the above condition mentioned for Ordinary Resident then he is known as Non-Ordinary Resident. While computing the period of stay in India, it is not mandatory that stay should be for a continuous period. But, the number of days of stay is considered. While computing the period of 60 / 182 days, the day of entering and leaving India should be considered as stay in India. If a person does not satisfy the conditions mentioned for being Resident of India then he is considered as Non Resident Individual (NRI). Income received or deemed to be received in India whether earned in India or not. Income which accrues or arises in India or is deemed to accrue or arise in India whether received in India or outside. Income which accrues or arises outside India and received outside India from a business controlled from India. Income which accrues or arises outside India and received outside India from any source other than income from business. Income which accrues or arises outside India and received outside India and remitted to India during the previous year. Income which accrues or arises in India or is deemed to accrue or arise in India whether received in India or outside India. You can use our Residential status calculator to know your Residential Status. Once you know your residential status, proceed to efiling of Income Tax Return.